Durable laminate requires little maintenance and is ideal for high activity areas. Compartmentalized storage with adjustable shelves helps relieve desktop clutter. Computer monitor can be positioned underneath for even greater space efficiency. Create an enclosed storage area with optional door kit. A place for everything and everything in its place! 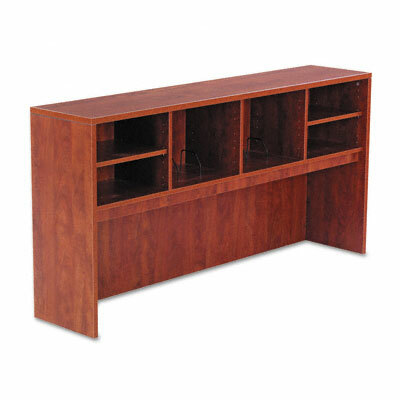 Increase productivity and reduce desktop clutter with this durable laminate hutch. As stylish as it is practical, it features a compartmentalized storage system with adjustable shelves and can accommodate your computer monitor underneath for even greater space efficiency. Valance and wire access is included to facilitate task lighting. Optional accessories like door kits and tackboards help you customize the hutch to your needs.